Among the lawn Buddhas, gemstones, and exotic miscellanea, I was drawn to a simple blue and white clothbound cookbook titled At Home on the Range . 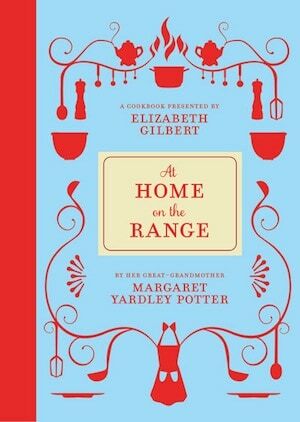 Presented by Gilbert and published by McSweeney’s, it is a re-issue of a book written by Gilbert’s great-grandmother, Margaret Yardley Potter. Stories flow into recipes and flow back into stories that become instructions for good living. An entire chapter is devoted to what to cook for weekend guests when feeling under the weather. Another chapter dedicated solely to eggs is rooted in my own grandmother’s philosophy that you’ll never starve as long as there’s an egg in the house. Potter was a skilled cook who mastered everything from eels, calf brains in black butter, breads, and a “dependable hollandaise sauce.” She was ahead of her time in her dislike of canned vegetables and processed foods, even as they were first coming into a fashion as a major timesaving innovation. Between the lines, you can hear Potter’s resolve to see the humor in life. Gilbert’s introduction tells us that that Gima’s life wasn’t terribly easy. Born into a wealthy Philadelphia family, she endured a difficult marriage, great financial losses, and bouts of alcoholism that landed her in psychiatric hospitals. She seems to have survived it all by sheer grace, wit, and clarity of expression. If you are inclined to believe in divine purpose (as I do), it seems there is a generational calling among the women of this family to share their lives on paper as a means of connecting deeply to others. Though At Home on the Range never achieved the thunderous success of Eat, Pray, Love, the approach of each book is the same: a deeply personal conversation, spoken right into the ear of the reader from the heart of the author who is making no apologies for her circumstances, struggles, or accomplishments. Potter’s introduction ends with a piece of advice as enjoyable as her sour milk muffins, a long-standing family favorite that Gilbert pulls out of the digressive narrative to more clearly define at the end of the book. Preheat the oven to 400˚F and generously grease a standard 12-cup muffin pan. Whisk the flour, sugar, salt, and baking soda together in a medium bowl. Whisk the egg yolk, buttermilk, and butter or oil together in a large bowl. Stir the flour into the egg and buttermilk mixture, then gently fold the beaten egg white into the batter. Divide the batter between the muffin pan wells and bake for 15-20 minutes, until the muffins are domed and tinged golden brown. Remove from the oven and cool in the pan for 10 minutes before serving.